Paris July 2012 – Terry Chellappah, the Wandering Palate’s Western Australia correspondent reports on good, bad and ugly encounters in Paris. After a glorious week in Burgundy soaking up the Cote d’Or, we hit Paris for a few days before London for a few more days en route home. My wife Amanda and I travelled with Jasper our 13 year old gourmand and our great friends Rob and Karen Gough. This time we were based in Le Marais, an area with a completely different vibe to our last apartment off Avenue de Wagram. Totally relaxed from our time in Burgundy, and although we had several restaurants on our hit list, we had no bookings locked in so it was going to be a challenge to get in to our restaurants of choice. We had satisfied our urge for more traditional Parisian dining when we were in Paris the week before Burgundy, so our sights were set on more contemporary restaurants this visit. We had been told that Restaurant Frenchie was a must do, but our several attempts to get through to them on the telephone had failed miserably. Even our French-speaking host at our apartment had no success. So we decided to just go there – early to take our chances. It was a comfortable walk to Rue du Nil and we found Frenchie down a quaint little alleyway, arriving at 6:00 PM. There was movement within, a few people waiting outside and so I knocked on the locked door. The Maître d’ looked up at me, and looked away. I left it a while thinking I might be too early. Then I tried again. Same response. I moved away and someone else knocked on the door, the door opened and in they went. So I tried again. Same result. I was beginning to get the message. Other people were being greeted, but not us. Frenchie Bar a Vin is across the narrow alleyway, so to sooth our soaring frustration, we worked our way into the tiny, busy bar and ordered some plates to share and a very agreeable bottle of Roussanne. The bar was very crowded as this was one of the hip wine bars in Paris. The service was abrupt, and a waiter came back to advise me that Roussanne was actually a grape variety and ‘did I know what I was ordering’? I thanked him for his concern and further offered that I was a wine producer from Australia, and believe it or not we actually made a Marsanne Roussanne. Now we were getting somewhere. His mood changed, slightly and continued to do so. The small plates we shared were very good, in particular the charcuterie superb. Clearly the attention to detail with the wine list and food was excellent, but this was not a comfortable environment to remain for any length of time. We explained our predicament to our new friend the waiter, and he in turn explained that they received 2,000 calls a day for reservations and the tiny restaurant could not cope with that. We agreed that was a lot of phone calls. He said he would see what he could do for us. We paid the bill, and moved outside for some air. By this time it was around 6:45 PM and the little restaurant across the way was now quite full, with the Maitre d’ standing outside smoking. Our friend the waiter went up to him, they conversed with much gesticulation, and a moment later a young lady emerged and told us that indeed they were fully booked. They had however a table of 5 cancel for the 6:00 PM sitting, and that we should have checked when we first got there. Really? Why hadn’t I thought of that? Here’s the thing. Frenchie enjoys an excellent reputation. It is clearly very popular, successful and by most accounts very good. In my book, none of that warrants the experience we had to endure. It would have been simple and polite to open the door, explain that they were fully booked, or otherwise and that would have been fine. Instead I was treated with disdain. We wandered back to our little street in Le Maris, only to find the street had come alive with people, bars and restaurants. Just next door, there was a restaurant with no apparent name that looked busy and buzzy, and they were open till late. We banked that idea and started to move on, when Rob stopped at the entrance to a Moroccan restaurant and stuck his head in. It looked great, and yes they had a table for 5. This was 404. 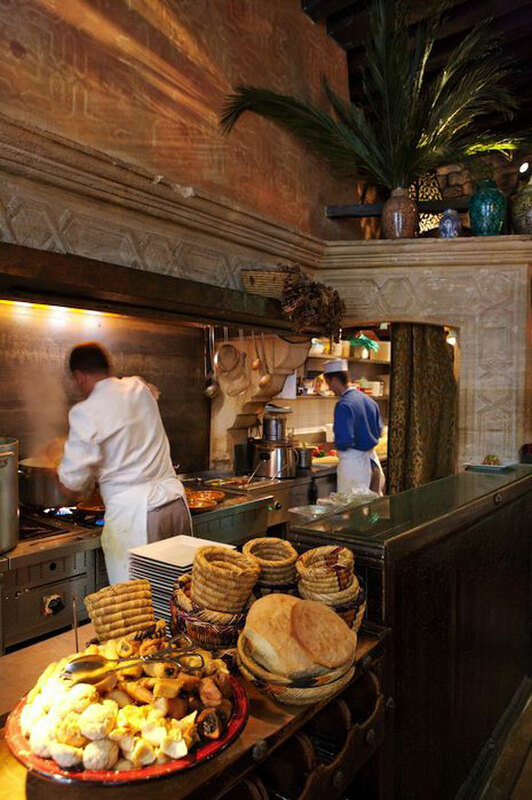 404 has been established for 19 years now, and features North African cuisine. It was treat stumbling on this wonderful, authentic restaurant so close to our apartment. The service, ambiance and food were excellent. Most importantly, we had a great time. The entrees, salads and tagines were delicious, as was my grilled lamb with cous cous. Rob and I snuck out later that night for a stroll and a nightcap, calling into a little corner brasserie. I was surprised when in response to my query, was told they stocked Averna, (the great Italian herbal digestive that The Wandering Palate himself introduced me to almost 2 decades ago) so we ordered and while our backs were turned the drinks poured to us at the bar. We turned around to see drinks bearing no resemblance to Averna, and on enquiring as to the providence of the elixir before us, were presented a bottle of Havana Rum! There is a pretty obvious moral to that story! Rob and Karen are friends of Jeremiah Tower, and one of his off the radar recommendations for lunch was Le Comptoir, the bistro at the Hotel Relai St Germain. No bookings are taken, so we planned to rendezvous for a late lunch the next day. This is a classic Parisian bistro from the outside, with all the right trimmings. After a short wait, we were shown to a small corner table, tight but comfortable and enjoyed a delicious, simple lunch with fabulous service from our waiter. The veal carpaccio was brilliant but the highlight of the meal was Rob’s to die for salt cod brandade. It was perfection on the plate, perfect in texture and utterly delicious. I still wistfully think about that one mouthful that he so generously shared with me! We reveled in a bottle of Didier Dagueneau “Pur Sang” Pouily Fume’ 2009. Still a puppy, the mineral meets seaside complexity of this wine was amazing. This was reminder of how a simple bistro lunch can be such a treat. If you find yourself fatigued by a heavy morning of shopping in St Germain, excellent sustenance can be relied upon at this little bistro, promoting it’s ‘bistronomy’ from dawn till late every day. Another of the hip not to be missed wine focused restaurants we were told of was Spring. We set off on a well needed walk through Paris to find this restaurant and wine shop and first spotted Spring Boutique. This is a cosy wine shop and tasting bar well fronted by an Expat American who we spent a pleasant hour with over a glass or two of wine. At his suggestion I shot down to the nearby Spring Restaurant hopeful of an unlikely last minute dinner reservation. With my confidence in tatters from the previous night’s exploits, I expected the worst. Instead, with pleasant memories of our dinner close to home last night, we decided to check out the place next to 404 that we were told was open late. Yes they had a table for us at 10:30. We had become used to eating late on this trip, and 10:30 seemed perfectly acceptable since it was daylight till 9:30 anyway. Our 13 year old was fine with it! This interesting place is part of the Mourad Mazouz stable of restaurants and as such associated with (and adjoining) 404. We were shown to a small private room ff the main courtyard, cosy and intimate with a large coffee table like dining table with lounge chairs scattered around it. Perfect! I have been to many restaurants that have tried to ‘invent quirky’; to be different and ground breaking for the sake of it. Many of those places fail, in my book because they lack the essence of a restaurant – a soul. That is something you can’t always put your finger on, but some places have it and some just do not, regardless of the pedigree of the operators and the investment it has required. Derriere is an eclectic, well devised and delivered restaurant from left field. The thinking behind the menu and wine list format and content is clever; entertaining and intriguing. Our waiter was first class; witty, helpful and employed reverse arrogance to the point that even he laughed at his faux arrogance. They kindly allowed us to bring one of our finds from the Cotes de Nuits – a Domaine Rion Vosgne Romanee 1er Cru 2007; which they happily decanted while we tucked into a racy A.C. Binner Riesling 2009. The menu is produce driven, with the key ingredient headlining and the method of preparation the support act. It reads well and stimulates the appetite with curiosity. I really enjoyed my rice with shellfish and saffron, a dish that bounced between risotto and Paella but never settled in either camp. The next day, Jasper and I walked the streets of Le Marais and with the call of lunch from within loud and clear, we made our way to a restaurant I had spotted the previous day. 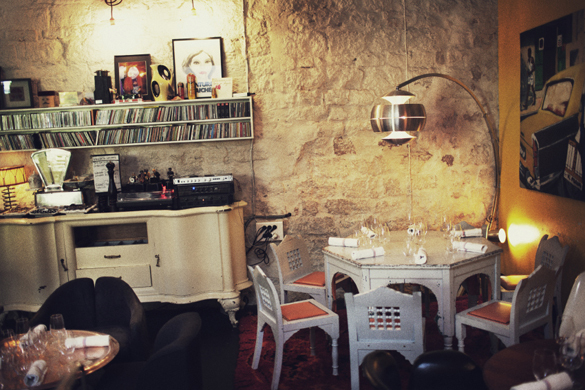 Restaurant Pramil is in the little Rue Verbois just off Rue de Turbigo in Le Marais, and it is as charming a place as you could find. We arrived early and settled into the simple and value for money fixed price lunch menu. My scallops and veal were well executed and Jasper’s pork cutlet very good; outdone only by his fantastic iced nougat dessert. This was our last day in Paris, and we really wanted a lovely dinner to cap off a wonderful two weeks in France. Relying on our trusty Michelin I-pad App, I had made a reservation at Alain Ducasse’ 1 Michelin Star Bistro Benoit which was within walking distance from our apartment. This classis Bistro was celebrating it’s 100th Anniversary, and we thought it would be a fitting last dinner in France. The evening did not get off to a good start, when we were shown to a plain little annexed room devoid of atmosphere off the main dining room. Well it was a last minute booking, so we thought it was to be expected. We kicked off proceedings with a bottle of Agrapart L’Avizoise Blanc de Blanc 2005, and the warning bells rang loud and clear when our sommelier poured two flutes – for Rob and myself, and none for the ladies! In shock, we sat there for a moment after she had left the table, looking at each other in amazement before trying to get her attention again. She came back to the table, we asked her why she only poured two flutes and she shook her head, apologized and rectified the error, promptly disappearing again. From that point on, our evening was a great disappointment. A long table of Italian tourists were ushered in; they were loud and on a hit and run mission, barely staying an hour or so but it was clear that we were in the tourist room. The food was clumsy and ill conceived, the service arrogant in the extreme (we never saw our sommelier again – instead we were served by a very junior waiter with little confidence) and overall as bad a restaurant experience as I think I have ever had. When I remind myself that this was also the most expensive meal we had in France, the sadness, and disappointment really kicks in. Sure, the Chateau Talbot Blanc 2006 and the Chave St Joseph 2005 eased the pain momentarily that is, until L’Addition arrived. The desserts in particular were the most ridiculous I can remember for an allegedly fine restaurant, massive in size and lacking any precision or thought.